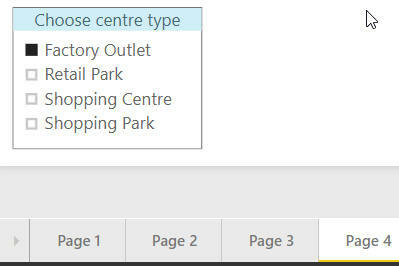 New features introduced into Power BI Desktop in this update include conditional formatting by different fields, the inclusion of filters in drill-through and minor improvements to line and funnel charts. For a cumulative list of all of the updates to Power BI Desktop in the last few year or two, see this blog. Our two-day Power BI Desktop course always uses the latest version of the software. The May 2018 update has introduced a couple of improvements to the synchronisation of slicers. Before I explain these, you'll first need to have the Sync slicers pane open. 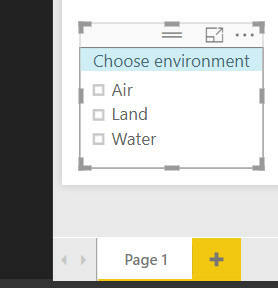 You can tick this box to show an additional pane for synchronising slicers. So I've got a slicer on page 1 of my report which allows me to choose an environment, and I want to put a copy of this onto pages 2, 3 and 4. I've selected the default Sync button in each case, so all of my slicers are synchronised. The slicers on pages 1, 2, 3 and 4 are all visible (that's what the right-hand column means) and all synchronised (that's what the left-hand column says!). 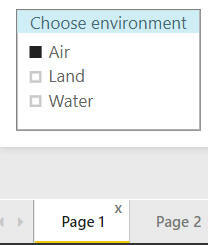 I've chosen to view data for the Air environment on page 1, but the slicers on the other 3 pages will now also show this same choice (that's what synchronisation means). I've selected the slicer on page 1, and typed in a group name of Hufflepuff. 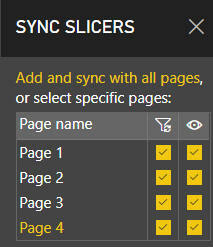 Notice that the Sync slicers pane is now showing that this isn't synchronised with any other slicer (because no other slicer belongs in the same group). 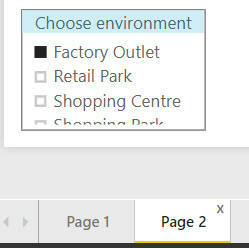 You can see from the ticks against page 1 at the top of this pane that the slicers on pages 1 and 3 are now synchronised, as they belong to the same group (Hufflepuff). Pages 2 and 4 belong to the same group too (although it's a different group from the one for pages 1 and 3). A neat way to choose how to synchronise slicers (although I do wonder just how many people would ever want to use this feature). The slicer has a different title, and filters by a different field. Good news: the field has been changed. Bad news: the title hasn't been. Meanwhile, the slicers on pages 1 and 3 haven't been affected, since they belong to a different group. What this shows is that data changes are replicated between two or more slicers in the same group, but formatting changes aren't.